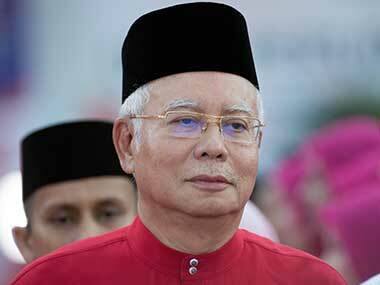 Kuala Lumpur: Malaysian Prime Minister Najib Razak unveiled a lavish election manifesto with cash benefits targeting rural ethnic Malays, his key voting bloc, as he faces an unprecedented challenge from a revived opposition led by his former mentor, Mahathir Mohamad. Najib, 64, is seeking a third term in office under pressure to improve his National Front coalition's performance after support eroded in the last two elections. He has been dogged by a massive corruption scandal involving the 1MDB state fund, which is under investigation in the US and other countries for allegations of cross-border embezzlement and money laundering. The 220-page election manifesto, which includes 364 pledges, was launched Saturday, the day Parliament was dissolved to pave the way for national polls expected in early May. His campaign slogan "Make my country great with BN", the Malay acronym for the National Front, has similarities with President Donald Trump's 2016 election motto "Make America great again." "This election is not about Najib versus the opposition leader. This election is not about BN versus the opposition," Najib told tens of thousands of supporters at the manifesto launching at a sports stadium near Kuala Lumpur. "The key question is which side can provide a better life for you, your family, children and grandchildren, as well as their future." Veteran opposition lawmaker Lim Kit Siang said the manifesto was "wrong and misleading." He said the 1MDB fiasco had turned Malaysia into a "global kleptocracy" and that voting for the ruling coalition will not make it great but will destroy Malaysia. The US Justice Department says at least $4.5 billion was stolen from 1MDB by associates of Najib and it is working to seize USD 1.7 billion allegedly taken from the fund to buy assets in the U.S.
Najib faces a strong challenge from 92-year-old Mahathir, Asia's longest-serving leader for 22 years before he retired in 2003. Mahathir returned to politics two years ago amid anger over the fiasco at 1MDB, which was set up and previously led by Najib, but which accumulated billions in debt. Mahathir now leads a four-party opposition alliance to oust Najib. Mahathir accused Najib of "terrorising" his opponents to win the polls after his nascent political party was ordered to temporarily disband over registration requirements. Analysts expect Najib to win due to recent electoral boundary changes, a buoyant economy and strong support from rural Malays, the bedrock of support for his coalition in a multi-racial nation that also includes ethnic Chinese and Indian minorities. The opposition has not managed to gain much ground in eastern Sabah and Sarawak states on Borneo island, which account for a quarter of parliamentary seats. It's also unclear how much influence Mahathir has among rural Malays.